We’d love your help. Let us know what’s wrong with this preview of She Who Laughs, Lasts! by Ann Spangler. 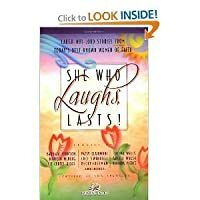 To ask other readers questions about She Who Laughs, Lasts!, please sign up. Be the first to ask a question about She Who Laughs, Lasts! This was just what the doctor ordered during a difficult week. The stories were down to earth and a lot of fun, and they really encouraged me to be myself, forget my mistakes, let my hair down and enjoy the life God has given me. This was nice to listen to, although it was a little choppy at times, being a compilation. I read inspirational and/or funny things when I'm having a lot of pain and in a struggle to hang on. Hope this one is a good one. 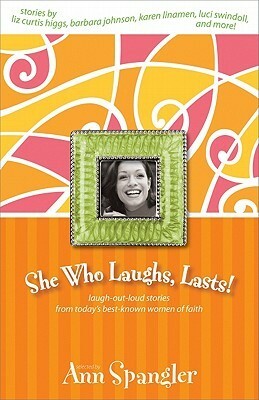 This was a collection of humorous anecdotes from various Women of Faith speakers. Some of the stories were funnier than others. But most of them gave me a little chuckle. It was a great listen that I didn't have to focus too hard with my listening skills. My favorite anecdotes were the "out of the mouths of babes" type stories. Those usually got belly laughs from me. A few stories in this compilation made me laugh until I had tears running down my face; others I wondered why they were incuded. Overall, a good book to to have on hand for a spare moment or through a sleepless night. A book of short stories by women of faith . The book is meant not only to give us a chuckle or two , but to let us know that we are all loved by God no matter what goes on in our crazy lives . A delightful read. I loved the short stories of faith and laughter. Very funny. Well worth reading. I loved Patsy Clairmont's "Lookin' Good," about the pantyhose and my kids asked me to read it over and over. Becky Freeman's "Overcoming with Worms" is another favorite that I read the whole family. Some of the other stories in here are intended for grown women only, but it's all gentle, good humor. This was an OK book. I would not highly recommend it. Some of the stories were funny but I guess it also helps if you had ever seen any of these women in person,to actually understand the humor behind some of it, which I had the opportunity to do so a few years ago for a WOF Conference. What a wonderful book to read when you are feeling ill. They say that laughter is the best medicine and this book dishes up in loads. If you are in need of some good old fashioned clean laughter this is the book to get hold of. This is a nice perk me up book. Nice, entertaining read, but not a book I'd want to keep and revisit. This book is from the "Women of Faith" absolutely hilarious! Ann Spangler is the best-selling author of numerous books, including Praying the Names of God, Women of the Bible, and Finding the Peace God Promises. An award-winning writer, Ann’s books have sold millions of copies over the course of her writing career. The mission of her books is to help readers strengthen their connection with God by encountering him in Scripture. Before becoming a writer, Ann Ann Spangler is the best-selling author of numerous books, including Praying the Names of God, Women of the Bible, and Finding the Peace God Promises. An award-winning writer, Ann’s books have sold millions of copies over the course of her writing career. The mission of her books is to help readers strengthen their connection with God by encountering him in Scripture. Before becoming a writer, Ann was an acquiring editor at various Christian publishers. From her unique perspective as an author and publishing professional, she believes readers are looking for well-written books that address the deep spiritual hungers that characterize our world. She is the mother of two teenage daughters, both of whom were born in mainland China. In her spare time (what is spare time? ), she loves to read, have dinner with friends, spend time on Lake Michigan’s beautiful beaches, travel, and stream British TV shows. An admitted Anglophile, she harbors deep prejudices in favor of anything British.